on October 24-25, 2013 in Kharkov, Ukraine. who was born 100 years ago. on September 25-27, 2012 in Kharkov, Ukraine. The Conference was dedicated to the memory of Prof. Pavel Bliokh, a famous Ukrainian radio scientist, who was born 90 years ago. The physical and mathematical sciences have been one of Kharkiv V. N. Karazin National University's strengths from the beginning. The Department of Space Radio Physics is the youngest constituent department in the School of Radio Physics. It admitted its first students in 1964. Students are free to choose one of these areas, space research or astronomy. The space research branch was established in 1964 by Prof. V. A. Misyura. The astronomy branch was established in 1976 by Prof. L. N. Litvinenko http://rian.kharkov.ua/index.php/en/. The astronomy research is conducted in the Institute of Radio Astronomy, National Academy of Sciences of Ukraine (4 Krasnoznamennaya St., Kharkiv, 61002 Ukraine). The Department now occupies a few spacious rooms in the main building of Kharkiv V. N. Karazin National University at the center of Kharkiv and operates Radiophysical Observatory. The Radiophysical Observatory is a unique facility in Ukraine allowing observations of ionospheric features and response over an altitude range from ~60 to 1000 km to be made simultaneously with magnetometer measurements. The department's reputation is grounded in its research work. The creativity and enthusiasm of Department's staff generates an international reputation in major areas of research including radio wave propagation, ionospheric and space physics. Kharkiv V. N. Karazin National University's Radiophysical Observatory, located approximately 50 km south of Kharkiv city, is a nationally sponsored facility for research and development in near-Earth space environment physics. The Radiophysical Observatory employs 41 persons. The Radiophysical Observatory is located on a 50-acre delightful green hilltop overlooking the Donets River near Gaydary settlement. An Affiliate of the Radiophysical Observatory is located on the site of the Ukrainian HF Radio Telescope of the Institute for Radio Astronomy at Grakovo settlement where the Department occupies a few rooms. have been planned for MS and Ph.D. students and as reference books for researchers. Over the years, the Statistical Radio Physics course was taught by Prof. Bliokh P. V., Prof. Tyrnov O.F., Prof. Fuks I. M., and Prof. Minakov A. A. The Department has a student/faculty ratio of 1/3. Each BS/MS/PhD student is assigned to a personal Supervisor who has overall responsibility for the student’s training and research. In addition, each student has a named instructor from research staff to whom they can turn for specific advice and guidance and who helps to monitor their progress. The Department comprises a group of talented and dedicated physicists, which means we can offer a caring tutorial system — a friendly atmosphere in which to learn alongside gifted practitioners. The Department promotes the professional development of students, outreach activities and balance between observations, modeling, analysis programs, and instrumentation development. The Department instructs graduate and postgraduate students and engages in research. The Department's total teaching staff of 26 individuals includes four Full Professor, seven Associate Professors, and 14 Teaching Assistants and Graduate Instructors. The Department of Space Radio Physics is one of the largest Departments in the School of Radio Physics and has over 20 undergraduate students, 10 graduates, and 1 postgraduate student. The Department employs about 76 persons on campus. In addition to the faculty, there are research, library and administrative staff and many others who, directly or indirectly, support the teaching and research goals of the Department. Seven former or present members of the Department faculty and staff have been awarded the Ukrainian State Prize in Sciences and Technology. They are Leonid F. Chernogor, Leonid S. Kostrov, Vsevolod A. Misyura, Valentin A. Podnos, Victor T. Rozumenko, Anatoly M. Tsymbal, and Oleg F. Tyrnov. Five members of the Department faculty and staff have been awarded the Prize of the Ministry of Education, and six have received the Prize of the Council of Ministers of the USSR. 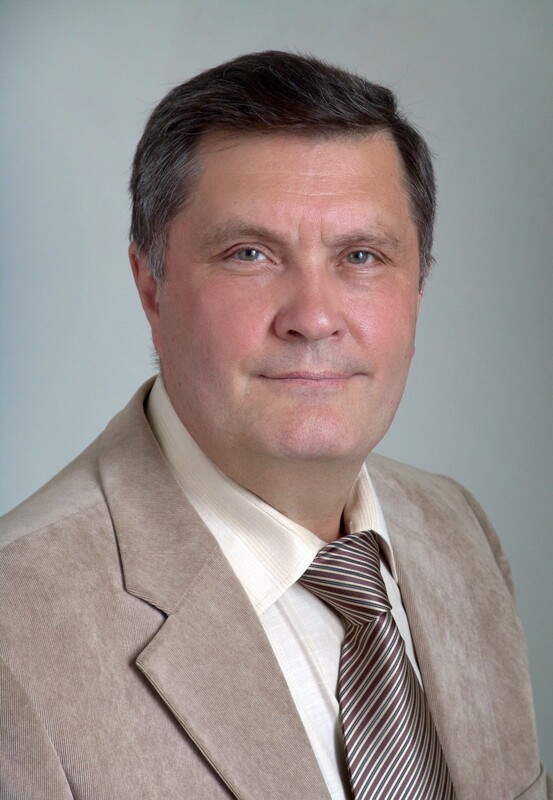 Full Professor, Head of the Department and Vice-Chairman of Commission G (Ionospheric Radio and Propagation) in the Ukrainian National URSI Committee. Improvements in accuracy of three-dimensional models of electron concentration and short-term ionospheric forecasting. Solar and magnetic effects on the public health. 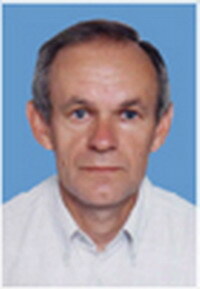 Full Professor, Fellow of Commission B (Fields and Waves) in the Ukrainian National URSI Committee, Fellow of the Scientific Council for Physics of the Ionosphere in Ukraine, Vice-President of the Academic Council conferring the Candidate of Science Degree (equivalent of American Ph.D.) and the Doctor of Science degree in radio science and a member of two other Academic Councils. Nonstationary theory of the interaction between high-power radio emissions and near-earth plasmas. Large-scale (thousands of kilometers) perturbations launched by high-power HF and MF radio emissions in ionosphere-magnetosphere plasmas. Physical processes appearing in near-earth space from localized sources of energy of different physical nature (magnetic storms, solar terminator, solar eclipses, earthquakes, volcano eruptions, high-power explosions, rocket engine burns, etc.). 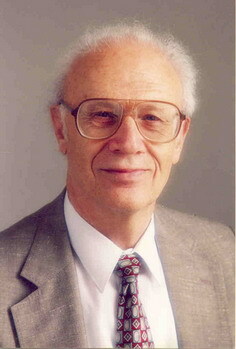 Author and co-author of more than 700 scientific publications, including five science books and sixteen textbooks. Theoretical physics, quantum radio physics, and astrophysics. Quantum radio physics: Theoretical prediction of the transparency band at the center of an absorption line under the influence of two resonating fields (in collaboration with Noble Prize winner A. M. Prokhorov). Surface wave-induced light scattering (in collaboration with V. K. Gavrik and A. V. Kats). Hydrodynamics. The prediction of the dependence of a superfluid helium film thickness on the flow speed. The determination of the range of sound spontaneous emission by a shock wave (D'yakov-Kontorovich instability). The acceleration and vortex pair production in radial flow (in collaboration with E. Yu. Bannikova, G. M. Reznik, and S. A. Poslavsky). Free-electron theory of metals. Elasticity equations taking account of the metallic conductivity electrons. Dispersion of sound in metals. The theory of wave turbulence. The anisotropic spectra of weak turbulence as an exact solution to the kinetic equations (in collaboration with A. V. Kats). Kats-Kontorovich transformations of the collision integral. Sea wave field spectra with a constant number of waves in the wave flux (in collaboration with A. V. Kats). Kolmogorov distributions of particles (in collaboration with A. V. Kats, S. S. Moiseev, and V. Y. Novikov). Astrophysics. Galaxy merging as a cause of the activity in their nuclei (in collaboration with A. V. Kats and D. S. Krivitsky). The diffusion theory of quasar and radio galaxy emission spectra in radio and x-ray wavebands when the injection source is moving (in collaboration with S. G. Gestrin, A. Y. Kochanov, E. Yu. Bannikova, M. S. Mikhailova). A toroidal vortex model for active galactic nuclei (in collaboration with E. Yu. Bannikova). The theory of radiation, propagation, and diffraction of electromagnetic waves; computational electrodynamics. 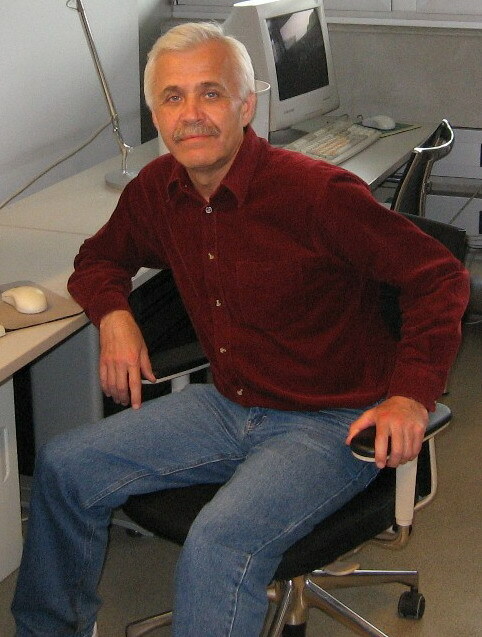 Research Interests: Radio astronomy, plasma astrophysics, theoretical physics. 1. V. N. Melnik, H.O.Rucker; A.A.Konovalenko; et al. Solar Type IV Bursts at Frequencies 10-30 MHz Solar Physics Research Trends (ed. Pingzhi Wang), Nova Science Publishers, New York, 2008, pp. 287-325. 2. Propagation of a Maxwellian cloud in a plasma. Solar Phys., 2000, v.196, p. 199. 3. Radar scattering by anisotropic Langmuir turbulance. Solar Phys., 1999, v. 184, No. 2, p.363. Arkhypov O. V., Antonov O. V., Khodachenko M. L. Solar Activity and Deep Convection Modeling // Solar Physics, 2013, vol. 282, No. 1, pp. 39-50. Arkhypov O.V., Rucker H.O. S-burst storms of jovian decametric emission as a test of hypotheses // Icarus, 2012, vol. 220, No. 1, pp. 216-224. Arkhypov O. V., Antonov O. V., Khodachenko M. L. Deep Convection and the Solar Chromosphere // Solar Physics, 2012, vol. 278, No. 2, pp. 285-298. Arkhypov O.V., Antonov O.V., Khodachenko M.L. Supergiant Complexes of Solar Activity and Convection Zone // Solar Physics, 2011, vol. 270, No. 1, pp. 1–8. 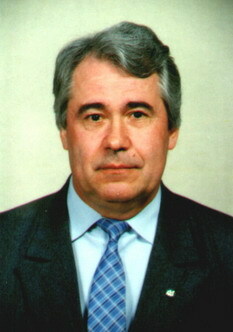 Khodachenko M. L., Kislyakova K. G.,. Zaqarashvili T. V., Kislyakov A. G., Panchenko M., Zaitsev V. V., Arkhypov O. V., Rucker H. O. Possible manifestation of large-scale transverse oscillations of coronal loops in solar microwave emission // Astronomy and Astrophysics, 2011, vol. 525, A105. 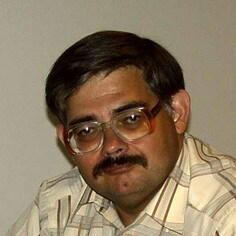 Arkhypov O.V., Rucker H.O. Shadows in S/NB-events of Jovian decametric emission // Icarus, 2011, vol. 211, No. 1, pp. 603–608. Arkhypov O.V., Rucker H.O. Dynamics of decametric radio-sources and standing Alfvén waves in Jovian magnetosphere // Icarus, 2011, vol. 212, No. 2, pp. 714–718. Arkhypov O.V., Rucker H.O. S/NB-events of Jovian Decametric Emission // Planetary Radio Emissions VII, Vienna: Austrian Acad. Sc. Press, 2011, pp. 219-226. Arkhypov O.V., Antonov O.V., Khodachenko M.L. Millimeter radio astronomy and the solar convection zone // Planetary Radio Emissions VII, Vienna: Austrian Acad. Sc. Press, 2011, pp. 419-426. Arkhypov O.V., Rucker H.O. Shadows in S/NB-events of jovian decametric emission. Icarus, 2011, vol. 211, No. 1, pp. 603–608. Arkhypov O.V., Rucker H.O. Dynamics of decametric radio-sources and standing Alfven waves in jovian magnetosphere. Icarus, 2011, vol. 212, No. 2, pp. 714–718. Arkhypov O.V., Antonov O.V., Khodachenko M.L. Supergiant Complexes of Solar Activity and Convection Zone. Solar Physics, 2011, vol. 270, No. 1, pp. 1–8. Khodachenko M. L., Kislyakova K. G., Zaqarashvili T. V., Kislyakov A. G., Panchenko. M., Zaitsev V. V., Arkhypov O. V., and Rucker H. O. Possible manifestation of large-scale transverse oscillations of coronal loops in solar microwave emission (Research Note), Astronomy and Astrophysics, 2011, vol. 525, A105. Arkhypov O.V., Rucker H.O. Regularity in dynamic spectra of Jovian radio decameter S-bursts, Astronomy and Astrophysics, 2009, vol. 496, pp. 269–274. Arkhypov O.V., Rucker H.O. S-bands of Jovian decametric emission, Astronomy and Astrophysics, 2008, vol. 482, pp. 1009-1014.